All relevant scientific research institutions in the world are accepting the fact that the foundations of smaller entity are genocide, crimes against humanity and war crimes. Therefore, the existence of such entities is offensive to all researchers, especially for genocide victims, on whose bones of the body that has built in the state-owned monument of genocide. The entity has occupied part of an independent, sovereign, internationally recognized state of Bosnia and Herzegovina, created by legalizing crimes of aggression and genocide. On the 9 January, 1992, the Assembly of the Serbian people in Bosnia and Herzegovina adopted the Declaration on the so-called “Serbian Republic of Bosnia and Herzegovina”. Name of the so-called “Serbian Republic of Bosnia and Herzegovina” in the Republic of Serbian entity was officially changed on 12 August, 1992. This is the beginning of the implementation of aggression against the Republic of Bosnia and Herzegovina and the implementation of genocide against its citizens, especially Bosnians. At this time Serbians started making genocidal to the ground state of Bosnia and Herzegovina. Most of those who are on ninth of January sat in the front row while adopting the Declaration on the proclamation of the so-called “Serbian Republic of Bosnia and Herzegovina” are now in prison. The aggression against the State of Bosnia and Herzegovina and genocide against its citizens is one of the most notorious fascist events after the Holocaust in the world. Therefore, this entity has no legitimacy. It was created by the aggression and genocide against Bosnians and Croats. The darkest place in Europe where is no legal, historic and moral preconditions for the application for eventual of independence. After the aggression and genocide in this dark entity crudest forms of human discrimination continue obstruction of return, suffocation of basic human rights and freedom of Bosnians and Croats, denying the state of Bosnian and Herzegovina. The entity, a product of the memorandum great Serbian Anti-Bosnian campaign, is one of the biggest Serbian defeat. The glorification of the entity is a lie of the Serbian nationalists to cover the misery and unhappiness failed many Serbian ideas. Entity threw Serbs in misery ethnically, culturally, religiously cleaned space in which distance themselves from their neighbors. The Serbian nation is closed to pure ethnic ghetto. Chauvinist hatred of Muslims and Croats in the dark ghetto is worst of all emotions that are nationalist leaders for inciting the Serbian people. This resulted in the slashing of state and society in Bosnia and Herzegovina and the Serbian defeat the idea of Bosnia and the Bosnian spirit of the bill failed nationalist idea of a Greater Serbia represented by the discriminatory concept of society and the state. An entity with its leadership, continues the idea of criminals on trial for the genocide. The last statement that the researchers considered a war cry and instigates a new aggression and genocide, hurting humanity and piety of Genocide, but also for all the victims and witness of aggression and genocide. Entity President urges all who love ‘Serbska’ to rally around ‘common goal’, because “Serbska experience as a state!”. Milorad Dodik says that the “Serbska ‘ is not in Bosnia and Herzegovina, will not sacrifice any of their rights, and that in a’ Serbska ‘exist only as long as she does by her own rules. 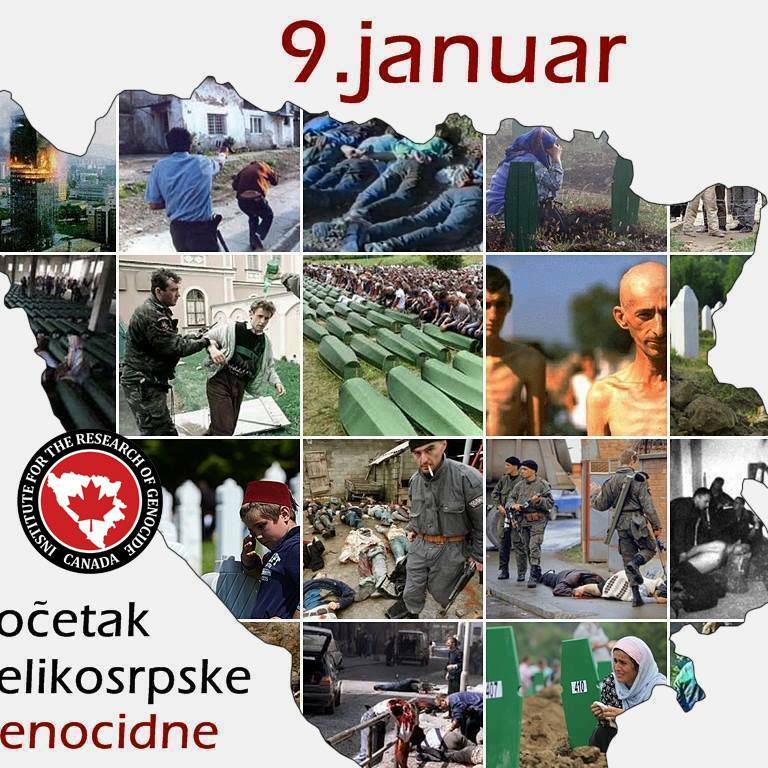 Marking the 9 of January as entities, the Bosnian Serbs unconsciously recognize the genocide and everything that is created as a result of these crimes. Insisting on the celebration of this day, it is the direct meaning of supporting policies that led to the aggression and genocide. The use of all methods to get to the finish line of the Greater a sequel hegemony in Bosnia and Herzegovina that can have unimaginable consequences for the future and the fate of both Bosnia and Herzegovina, as well as Europe and the world. An entity exists in a culture in which Slobodan Milosevic, Radovan Karadzic, Ratko Mladic, Draza Mihailovic and other heroes, in which the young people educate them self from the series ‘Straight Mountain’, which performs a complete audit history and anti-fascist past. All those who celebrate the day of the entities, the celebrate same glory of aggression and genocide. What entity celebrates originated the screams and cries of hundreds of thousands of victims, the bones of the murdered children, the rapes, the tortures in the concentration camps. The darkest area is the biggest threat to peace in Bosnia and Herzegovina, Europe and the world. Therefore, it should not and can’t tolerate the existence of the area whose name itself irrefutable example of discrimination. It can’t genocidal creation motto entities to seek exclusive rights for the Serbs in that entity, and look for all the law at the state level. This temporarily occupied parts of Bosnia and Herzegovina has a starting constructional fault, because it was made by the aggression and genocide. From the point of Genocide 9 January is the beginning of the genocide against Bosnians and Croats. Creating the entity was not a reaction, but aggression on the legal order and the lives of Muslims and Croats, whose fault was that they were not born as a Serbs. The existence of the entity is offensive to all researchers of genocide, especially for genocide victims, on whose bones he built this monument parastatal genocide. On behalf of the truth about the crimes of aggression and genocide and justice for the victims of these crimes, we invite all researchers of genocide in the world to mark the January 9 as the Day of the beginning of the genocide in Bosnia and Herzegovina. 9 January reminds researchers of genocide to the horror of the Bosnian genocide and destruction of the Republic of Bosnia and Herzegovina. Researchers say that genocide occurred creation aggression and genocide must disappear because Bosnian and Croatian people are still denied by basic human rights and freedoms.